According to a study published in The Lancet Infectious Diseases, the dangerous, artemisinin-resistant malaria is clawing at the borders of India and Myanmar. Emergence of artemisinin resistance in southeast Asia poses a serious threat to the global control of Plasmodium falciparum malaria. Discovery of the K13 marker has transformed approaches to the monitoring of artemisinin resistance, allowing introduction of molecular surveillance in remote areas through analysis of DNA. We aimed to assess the spread of artemisinin-resistant P falciparum in Myanmar by determining the relative prevalence of P falciparum parasites carrying K13-propeller mutations. We did this cross-sectional survey at malaria treatment centres at 55 sites in ten administrative regions in Myanmar, and in relevant border regions in Thailand and Bangladesh, between January, 2013, and September, 2014. 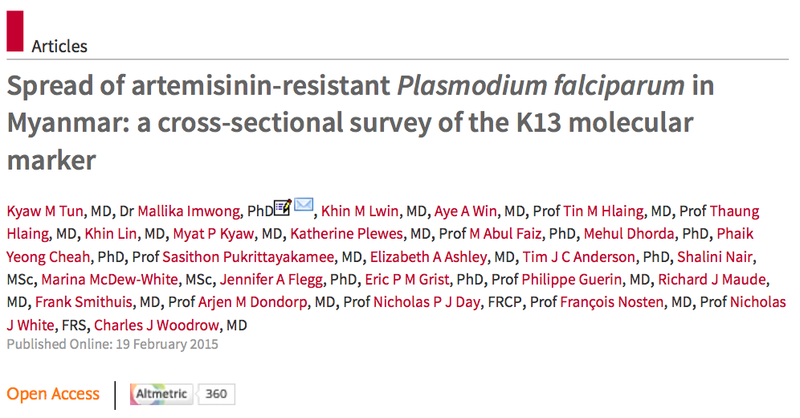 K13 sequences from P falciparum infections were obtained mainly by passive case detection. We entered data into two geostatistical models to produce predictive maps of the estimated prevalence of mutations of the K13 propeller region across Myanmar. Overall, 371 (39%) of 940 samples carried a K13-propeller mutation. We recorded 26 different mutations, including nine mutations not described previously in southeast Asia. In seven (70%) of the ten administrative regions of Myanmar, the combined K13-mutation prevalence was more than 20%. Geospatial mapping showed that the overall prevalence of K13 mutations exceeded 10% in much of the east and north of the country. In Homalin, Sagaing Region, 25 km from the Indian border, 21 (47%) of 45 parasite samples carried K13-propeller mutations. Artemisinin resistance extends across much of Myanmar. We recorded P falciparum parasites carrying K13-propeller mutations at high prevalence next to the northwestern border with India. Appropriate therapeutic regimens should be tested urgently and implemented comprehensively if spread of artemisinin resistance to other regions is to be avoided. This poses a real threat to India, which has already got enough problems tackling the issue of malaria control. The only plausible way of combatting the main reason for drug resistance emergence (that is, incomplete or inadequate therapy) can be combatted by ensuring adequate availability of prescribed regimens of therapy from government clinics and treatment centers (free of cost). Tags: Drug Resistance, malaria. Bookmark the permalink.